The Couple // We met sophomore year in college through mutual friends while living in the same residence hall. The night we met, Kallie was on a walk through campus with a couple friends. On the way, Kallie's friends stopped to talk with 3 guys skating on longboards in the middle of campus. That's when Kallie and Alex officially met. At the time, Kallie thought long boarding was an interesting hobby and wanted to try it out. Alex was eager to teach her the basics right then and there. The rest of the night both groups hung out. We actually all went on a "ghost hunt" through a supposedly haunted section of town. When we think back to when we first met, we always laugh and say how we went ghost hunting together. At the time, each of us had a significant other, but over the summer we both became single and remained great friends. Upon arriving back to school the following August, we became a couple and have been together since 2012. 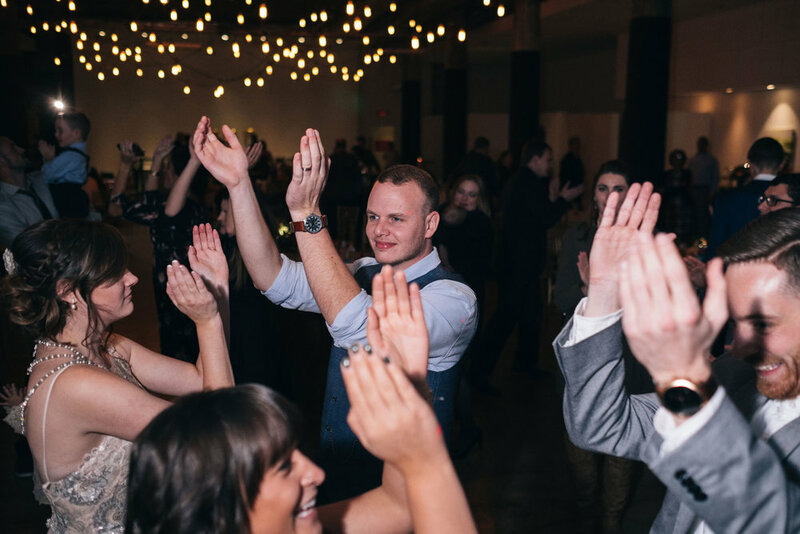 On October 28, 2016 Alex asked Kallie to marry him with the help of their photographer friends at Swatch Studios. One of the photographers, Diana, and Kallie are good friends and were planning to have a crafting girls night. Little did Kallie know that Diana wasn't actually going to be hanging out with her much that night. Diana had a pit stop to "take some photos" of her friends for a family session out at Oak Openings. Kallie tagged along expecting to help. As soon as they both got out into the pine forest Kallie realized what they were actually doing. 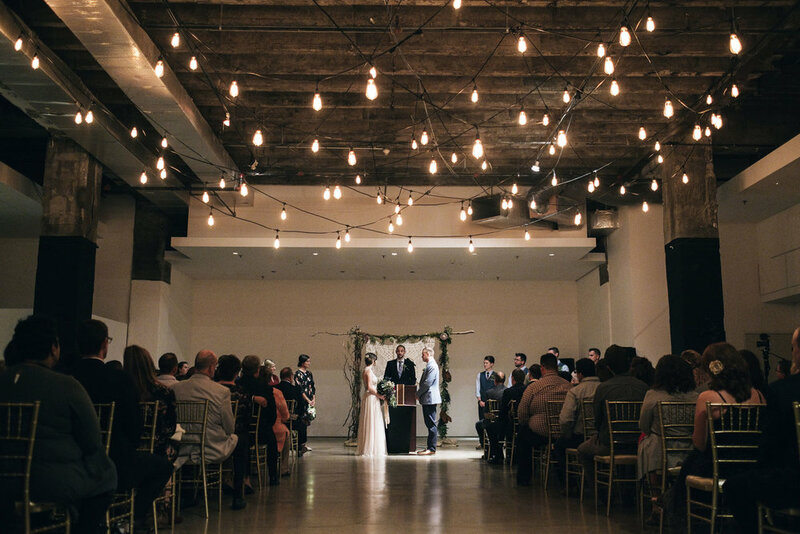 Alex had strung up lights, got down one knee and popped the question. 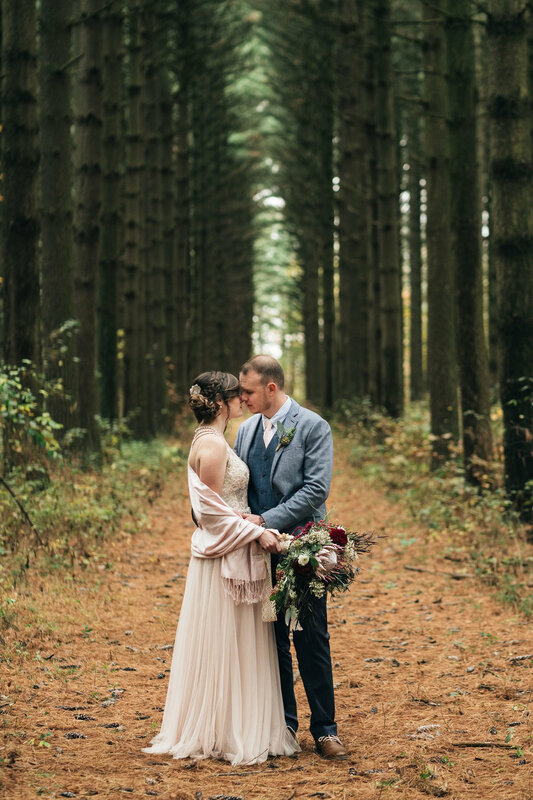 Exactly one year later on October 28, 2017 they got married, with of course, a pit-stop to where they got engaged, Oak Openings. The Couple // The vision for our day was to have it reflect us and our styles. We wanted to combine things we felt were important even if that meant it was untraditional or unique. I guess the best words to describe the overall feel for the day are: earthy, boho, adventurous and urban. We wanted to include elements that reflected both of us. Kallie is very hands-on and DIY. She has a creative eye and loves unique things. 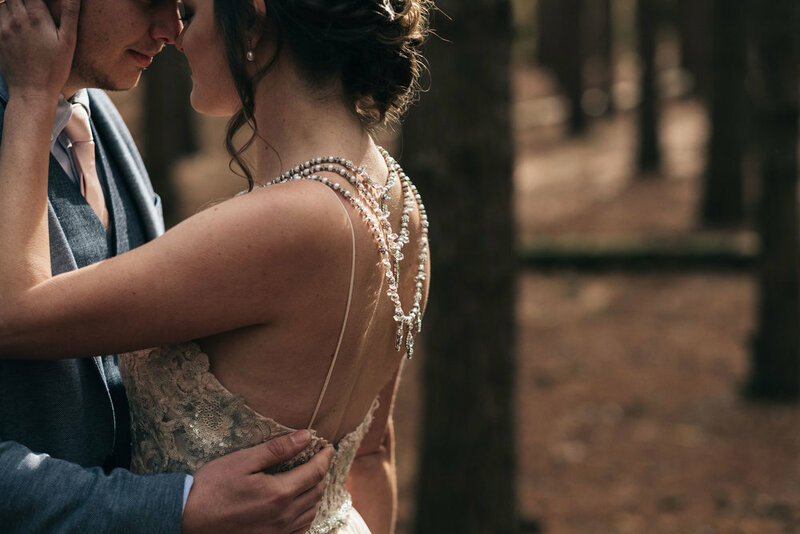 She had a big hand in creating or adjusting pieces throughout the day, such as creating her own boho macrame backdrop and customizing her wedding dress. 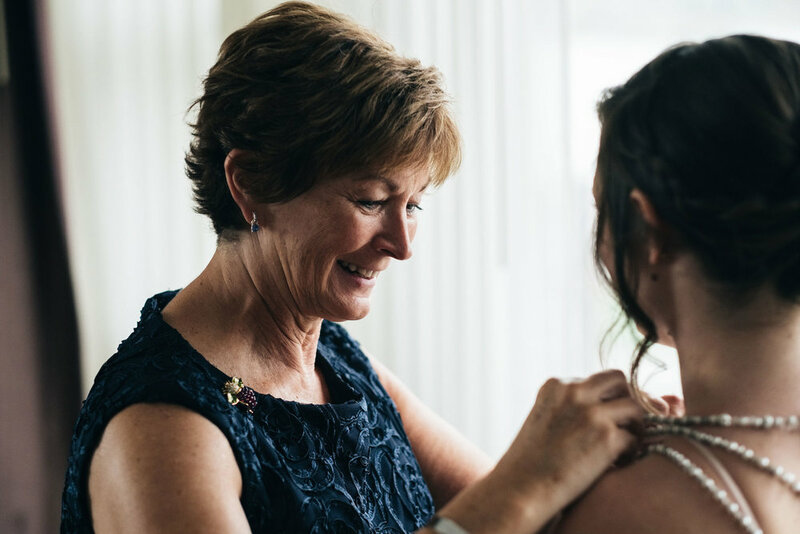 She purchased a bridesmaid dress from Belle Amour Bridal shop and had Jane's Perfect Fit add more appliqués, a back piece, and belt to it to make it look like an entirely different dress. The bridesmaids wore mix-matched dresses that incorporated dark, rich colors. 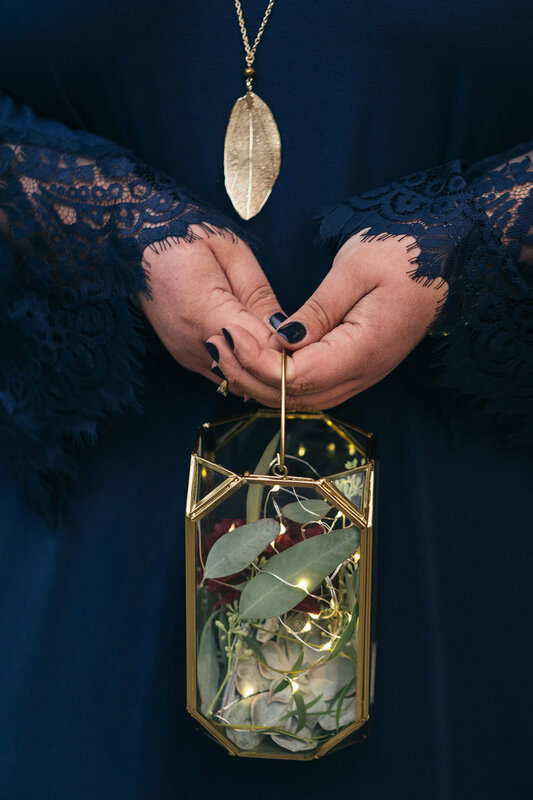 Instead of bouquets they carried gold lanterns with fairy lights and greenery inside. 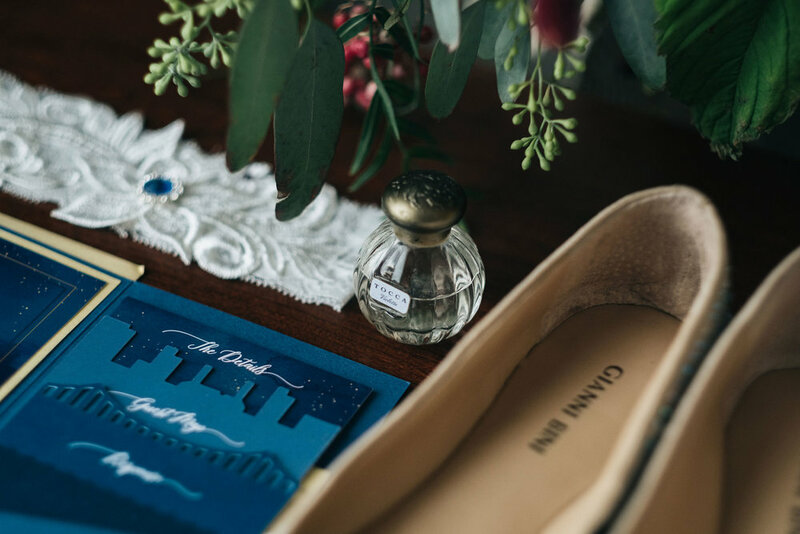 She even created her own custom-cut invitations through her stationery company Pip & Cricket. 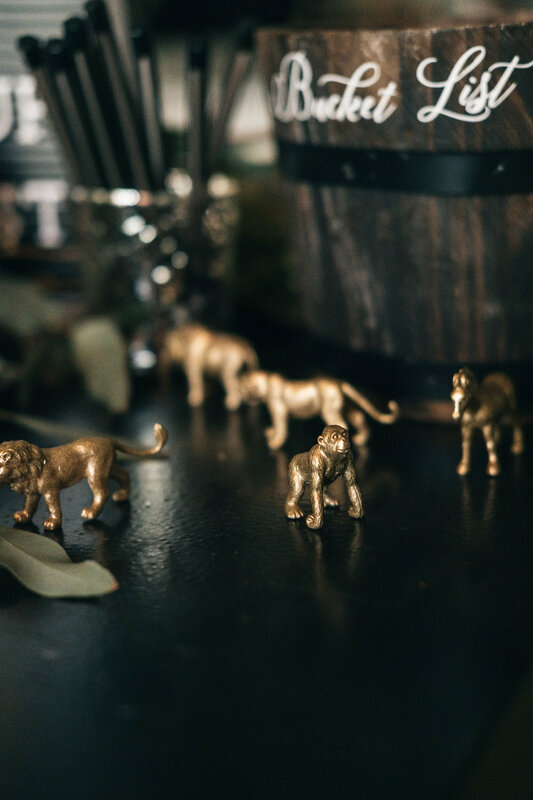 Alex is a world-traveling wildlife filmmaker and that’s where the gold animals on the tables as well as the globes became accent pieces throughout the reception. 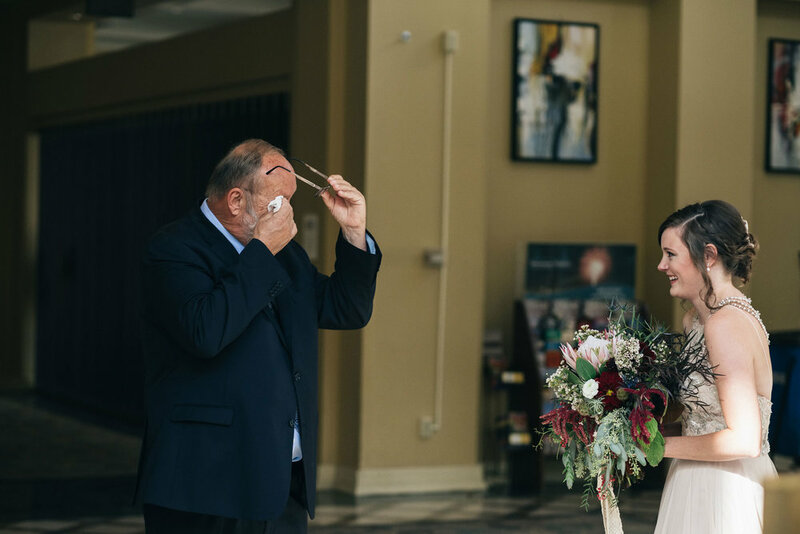 We both wanted to have family be a big part of the actual ceremony, that's why Kallie's brother became ordained and performed the official parts of the ceremony, but the only other speaking parts were performed by Alex's two brothers. Alex and Kallie both love donuts and so donuts were served instead of cake at the reception. Donuts were provided by Wixey, but of course Kallie wanted them to look unique with gold sparkles and marble icing. 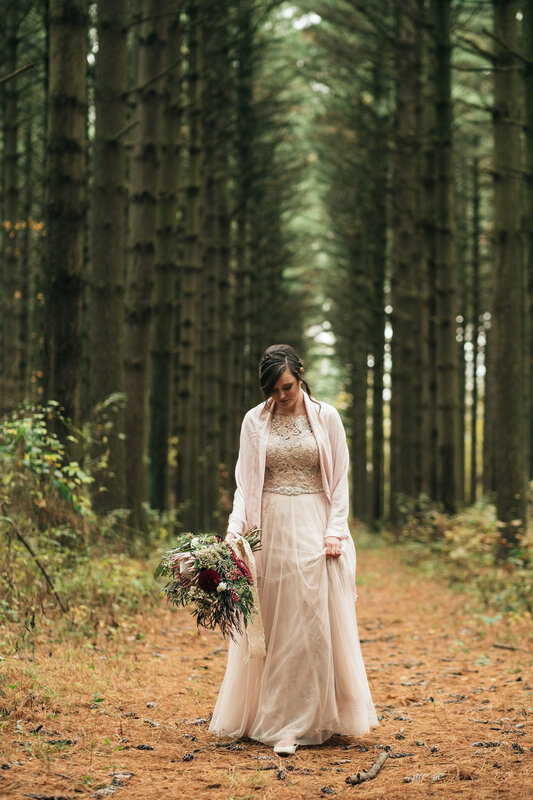 As mentioned above, we also made sure to go back to Oak Openings, the place we got engaged one year prior, to have photos taken on the day of our wedding. 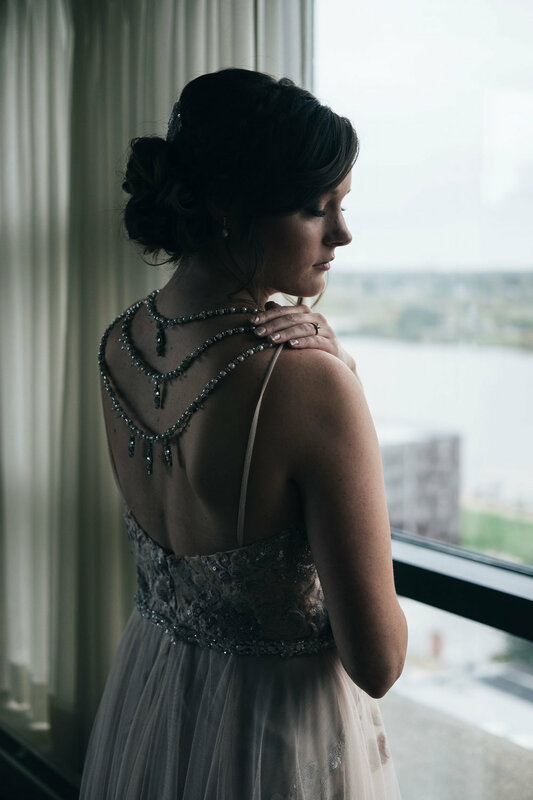 All of the vendors we chose matched Kallie's vision perfectly. 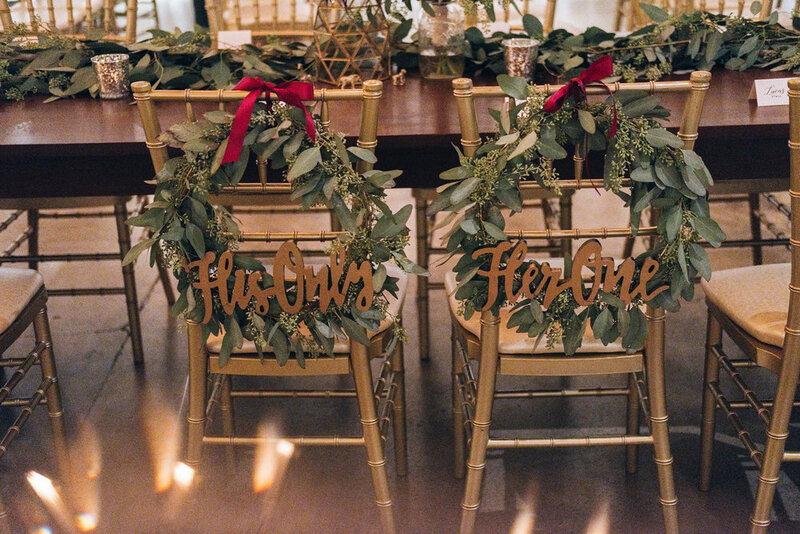 All of the florals and greenery were provided by Ella Flora – she matched our style PERFECTLY for our day and I couldn't have been happier with how all the bouquets and table centerpieces turned out. I still get compliments about my bouquet from my wedding and I was blown away with how amazing it was when I saw it the day of. Swatch Studios did our photography and videography and did such an amazing job not only capturing the important parts but all the candids and details. 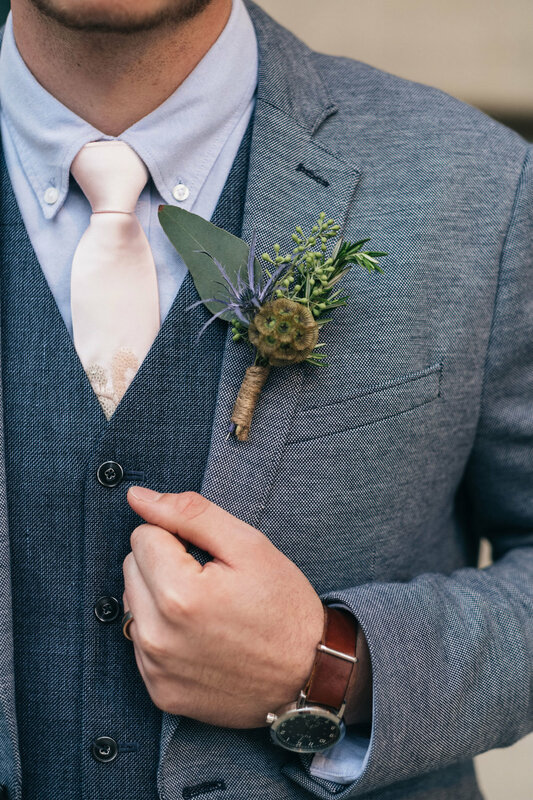 After going through the photos, I was so pleased with how many small details they took pictures of, including the bee pin on my bouquet that was in memory of my aunt who passed. I had no idea they even noticed! Makeup was done by Raquel with Wildflower Salon and she knew exactly how to enhance my natural look for perfect keepsake photos.